by Bayesia Singapore Pte. Ltd. Understand the core mathematical concepts of the Bayesian networks formalism. Use BayesiaLab for elementary knowledge modeling and probabilistic reasoning. Recognize the crucial difference in modeling between observational inference (prediction) and causal inference (intervention). Use BayesiaLab's supervised learning algorithms for predictive modeling and the analysis of effects. Employ BayesiaLab's unsupervised structural learning algorithms for exploratory data analysis. One-day classroom session in Gurgaon on April 3, 2019. Unlimited access to exercises, examples, and datasets for self-study. BayesiaLab 101 is a new course introducing you to Artificial Intelligence with Bayesian networks for research, analytics, and reasoning. "Bayesian Networks have become one of the most complete, self-sustained and coherent formalisms used for knowledge acquisition, representation and application through computer systems." Hence, this class is a must for innovators, engineers, and scientists in today's knowledge-based economy. The objective of BayesiaLab 101 is that you become familiar with the mathematical and information-theoretical foundations of Bayesian networks and BayesiaLab in order to understand their central role within the spectrum of artificial Artificial Intelligence tools and technologies. This new course format combines a one-day classroom session with a 60-day BayesiaLab Education Edition license plus an extensive array of online training materials for self-study, e.g., Bayesian network examples, case studies, and data sets. Additionally, you have access to a dedicated online forum that facilitates discussions with your fellow course participants. 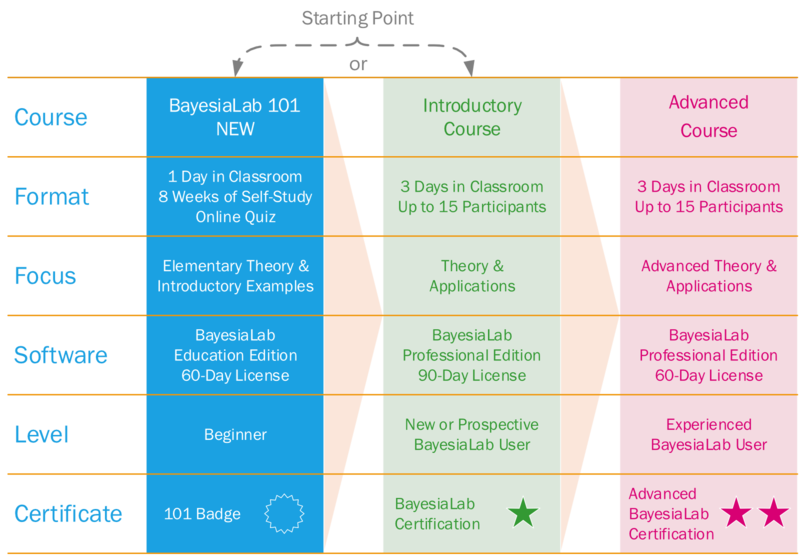 Finally, at the end of the 60-day license period, you complete an online exam to receive your BayesiaLab 101 Certificate. The one-day classroom session at the beginning of the BayesiaLab 101 course focuses on the fundamentals of the Bayesian network paradigm, such as how Bayes's theorem facilitates probabilistic reasoning with graphical models. The hands-on exercises in the classroom session emphasize developing an intuition for Bayesian inference. Similarly, you will rehearse the basic functionality of BayesiaLab during the classroom session so you can you to work independently on exercises during the license period. It is important to note that the classroom session puts great emphasis on mastering the basics through elementary exercises before proceeding to more ambitious applications. We want you to develop an in-depth comprehension of the underlying principles, so you can ultimately progress to more complex models, such as the ones you would encounter in the three-day BayesiaLab Courses. BayesiaLab 101 is also an excellent preparation—but not a requirement—for the more comprehensive Professional BayesiaLab Courses that we offer on a regular basis around the world (see comparison chart below). Compared to the three-day courses, BayesiaLab 101 provides a shorter and more streamlined introduction but does not take any shortcuts. Given the smaller classroom component with BayesiaLab 101, we are able to offer this new course at a more accessible price point. There is no formal educational requirement, although most participants typically have a bachelor's or master's degree. Basic data manipulation skills, e.g., handling tabular data with Excel. Familiarity with basic statistical techniques, such as regressions. No programming/coding skills are required. You will exclusively use the graphical user interface of BayesiaLab for all exercises. For a general overview of Bayesian networks, we suggest that you download a free copy of our book, Bayesian Networks & BayesiaLab. Although by no means mandatory, reading its first three chapters would be an excellent preparation for the course. What to prepare for the classroom session? Program participants need to download and install BayesiaLab on a WiFi-enabled laptop/notebook with a Windows or Mac operating system prior to the start of the classroom session. Technical support for the BayesiaLab installation is available during the week prior to the classroom session, but not on the day of the classroom session. All technical issues need to be resolved beforehand. A Linux version of BayesiaLab is also available for download, but there will be no technical/installation support to those who choose to install it. Participants must bring their own computer to the classroom session. Using a mouse as a pointing device is highly recommended. Please feel free to dress comfortably, but bear in mind that our classroom is in an office environment. A complimentary lunch will be served around 12 noon. Coffee and tea will be available throughout the day. Course cancellations by participants will be refunded in full up to 30 days prior to the classroom session. Within 30 days prior to the classroom session, cancellations by participants will not be refunded but can be applied to future training programs or BayesiaLab software products (prevailing list prices apply). On or after the date of the classroom session, refunds or credits will no longer be issued. Bayesia reserves the right to cancel the course prior to the date of the classroom session for any reason. In the event of the cancellation of the course by Bayesia, all fees will be refunded to the participants in full within three days. The BayesiaLab Education license is not renewable beyond the 60-day course period. Bayesia is not responsible for any expenses the participants incur in the context of the course or in the event of its cancellation. All travel expenses in conjunction with the course are the participant's own responsibility. The BayesiaLab software is licensed by Bayesia S.A.S. All course fees are invoiced and charged by Bayesia Singapore Pte. Ltd. in Singapore Dollars. The one-day classroom session is provided on a complimentary basis with the purchase of the course package, which includes the 60-day BayesiaLab Education Edition license, online training materials, access to the online forum, and a BayesiaLab 101 Certificate. All materials related to the course are produced, copyrighted, and hosted by Bayesia USA. They are delivered electronically to course participants via Bayesia Singapore Pte. Ltd.
No course participant shall copy, distribute, or resell the course materials without the explicit written permission from Bayesia USA and/or Bayesia Singapore Pte. Ltd.